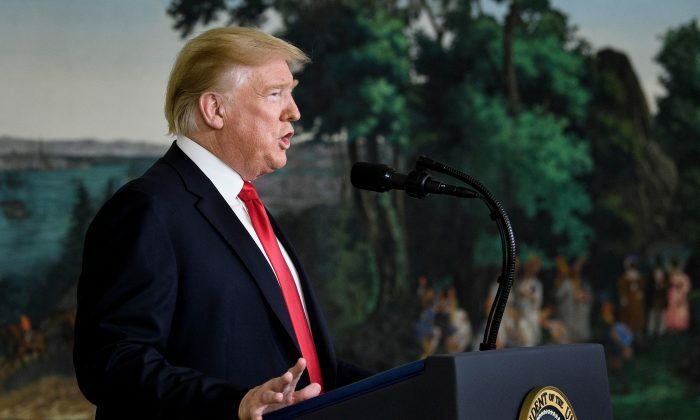 President Donald Trump laid down a proposal for a border security compromise that would provide temporary protection from deportation to some 700,000 illegal immigrants in exchange for border wall funding. House Speaker Nancy Pelosi (D-Calif.) rejected the offer, but her response seemed to leave some room for negotiation. Trump and the Democrats failed to reach an agreement on the border wall funding, which lead to some quarter of the federal government to shut down on Dec. 22. Speaking from the White House on Jan. 19, Trump presented the case for there being a humanitarian crisis at the border, including the statistic that thirty percent of the women who make the trek to the U.S. border suffer sexual assault, which the White House says was reported in 2017 by Doctors Without Borders. He then went over his arguments for border security, such as the fight against drug and human trafficking, criminals sneaking in, and the economic impact of illegal immigrants. He retained the demand for $5.7 billion for border wall construction, but repeatedly qualified the plan. He invoked the authority of border security officials, who back the need for a barrier. Trump further called for $800 million for humanitarian assistance, medical support, and new temporary housing at the border. Another $805 million would go to additional drug detection technology at ports of entry, where most of the illegal drugs enter the country. In a sign of compromise, he offered three years of “legislative relief” for the 700,000 recipients of Deferred Action for Childhood Arrivals (DACA), illegal immigrants brought to the United States as children. The relief would allow for work permits, social security numbers, and protection from deportation. In September 2017, Trump rescinded DACA, but federal judges in New York and California put his action on hold. Trump previously said he expected his action would be upheld by the Supreme Court, which may rule on the issue sometime this year, perhaps in the summer, he said. Nearly 440,000 have come to the United States under the program since its inception in 1990 (pdf). In July, the administration extended the program for Somalia and Yemen. But it’s scheduled to expire in 2019 for Nepal, South Sudan, and Syria. Trump ended the program for Sudan, Nicaragua, Haiti, and El Salvador, but again, a federal judge put his decision on hold. The idea to offer Democrats a DACA and TPS deal in exchange for the wall funding was floated by Sen. Lindsey Graham (R-S.C.), who said Trump found the idea “interesting” after the two lunched on Dec. 31. In addition, Trump’s proposal includes 2,700 additional border agents and other law enforcement personnel and 75 immigration judge teams. The immigration court system is extremely overburdened with a backlog of nearly 900,000 cases. If Democrats were to accept Trump’s proposal and the government reopened, he pledged to hold weekly bipartisan meetings on broader immigration reform—an issue with bipartisan support, though each party envisions it differently. Trump said Senate leader Mitch McConnell (R-Ky.) is ready to put legislation enshrining Trump’s proposal to a vote. Republicans would need at least seven Democrat votes to overcome a filibuster in the Senate. The main hurdle, however, is in the House of Representatives, where Democrats hold majority. However strained already, Trump’s relationship with Pelosi has been put to further test over the past week. In an exchange of power moves, Trump denied Pelosi foreign trip using government plane on Jan. 17, when she was already on her way to the airport, leading to an embarrassing moment when she was forced to turn around and later cancel the trip. Trump appeared to be responding to Pelosi’s withdrawing invitation to Trump for the annual State of the Union address on the House floor. Pelosi cited security reasons, telling Trump to reschedule for after the government reopens, but the Secret Service rebuked the security argument. Pelosi and her husband Paul own a Napa Valley vineyard worth at least $5 million, according to Roll Call. Pelosi’s office didn’t respond to a request for comment. In an online statement on Jan. 19, Pelosi rejected Trump’s proposal, though her response seemed to offer some ground for negotiation. “Dreamers” is another word for illegal immigrants who came to the country as minors. Pelosi went on to list four border security measures the Democrats support: additional ports of entry, new drug detection technology, hiring more than 3,000 customs and border patrol personnel, and more immigration judges. Three of these measures appear to be a part of Trump’s proposal. Graham previously said that Democrats would have to offer much more than $5 billion for the wall to get a permanent solution for DACA. Trump has backed protections, including legal status for the DACA population, before. But in exchange, he wanted $25 billion for the border wall and other security as well as moving the immigration system to one that is more merit-based. Correction: A previous version of this article misstated the status of Rep. Nancy Pelosi’s trip overseas. She cancelled the trip. The Epoch Times regrets the error. Update: Further information was added regarding Rep. Nancy Pelosi’s withdrawing invitation to President Donald Trump for the State of the Union address.